This morning, I came across USA Today’s list of TV shows that may not return next year. With such a void opening up in the fall schedule, allow me to humbly suggest three words to any network execs that may be reading: Gadgetbox: The Series . Eh? Eh? I expect we could get four or five seasons out of it, no problem. Just attach some more talent: Aaron Sorkin, say—he’s not doing anything right now. Instant hit . Call me. Back to the present, though, as today’s edition of Gadgetbox brings you a bit of game console news, some more reports from the Format War front, and the latest in “see ‘round corners” technology. So long, 20GB PS3. 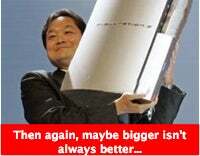 News came this past week that Sony was discontinuing the $499 20GB model of the PlayStation 3 in the US; that model had been decried in this very blog and elsewhere as an underpriced, underpowered LameStation that lacked not only the capacious hard drive space of its elder sibling, but also wireless networking and flash card readers. Seems the 20GB’s big brother, the $599 60GB model, was outselling the little feller by a rate of 10 to 1, so Sony’s decided to put all their eggs in that basket… for now . Almost simultaneously came news that Sony was investigating the feasibility of producing a new, even larger, 80GB model, no doubt spurred on by Microsoft’s jump to 120GB of storage with the Xbox Elite. The news leant credence to an earlier leaked FCC filing (this, my friends, is why Steve Jobs announced the iPhone six months early) reporting that Sony had sought approval for an 80GB version. Now if there’s a cardinal rule for storage, it’s this: like Jello chocolate pudding, you can never have too much. There’s nothing surprising at Sony upping the capacity; the question on everyone’s mind, though, will be the price point. Will we see the 60GB drop to $499 and the 80GB enter at the 60GB’s old $599 spot? Or will the 80GB come in at a yet higher price? The PS3 has had an upward battle since its launch, but more bang for your buck could be just the shot in the arm it needs. See, if I had the 80GB model, I could have probably fit a few more cliches in that last line. If you’ve found yourself largely oblivious to the Format War raging somewhere far, far overhead, don’t trouble yourself. Instead of worrying about the blow-by-blow accounts, let me just pass along the highlights from the last week or so. 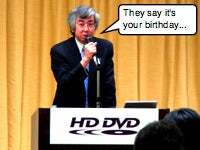 Yesterday, for example, marked HD-DVD’s first birthday. Naturally, they celebrated with a cake in the shape of Toshiba’s new HD-A2 player, an embarrassing card from Blu-Ray, and announcing that they had sold 100,000 stand-alone players (that number doesn’t include either the HD-DVD add-on for the Xbox 360 or PC HD-DVD drives). Blu-Ray is behind in this department, having moved only 25,000 stand-alone players as of January, not including the PlayStation 3 (which has sold over a million units—shhhhh). HD-DVD has also been gaining in Europe, outselling Blu-Ray discs there by a rate of 3.5 to 1. For those that are still hoping to see some sort of reconciliation, I wouldn’t hold your breath. But if you’re looking to consolidate your boxes, Samsung announced that it would ship its Duo HD hybrid player this holiday season. Sammy’s player would be the second hybrid to ship, after LG’s BH100 was announced earlier this year. No price point has yet been revealed, but expect it to cost you at least a cool grand to make everybody (read: Sony and Toshiba) happy. Meanwhile, let me suggest to you my own personal approach for dealing with the Format War: watching standard DVDs on a 27” standard definition CRT television. Trust me, it looks sweet . 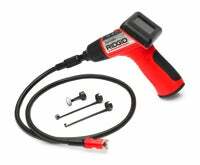 RIDGID’s SeeSnake micro isn’t just for seeing around corners. Which is good, since I object in principle to spending more than $200 on something I could do with a $10 periscope from Toys ‘R’ Us. This thing, however, is a periscope on speed . At first, I was satisfied imagining the hours my buddies and I could while away playing SWAT with this sucker, but then, apropos of nothing, I concocted the following scenario. Let’s say—completely hypothetically, of course—that you’ve managed to yet again knock your roommate’s keys underneath the refrigerator. And let’s say that said hypothetical roommate is a tad upset. No problem with the SeeSnake: just feed its 3 foot cable under the fridge and show him on the 2.5” color LCD display that his keys are just fine, albeit still stuck under the fridge (that’s where the optional hook attachment comes in handy). I also might recommend not telling your roommate that you keep throwing his keys under the fridge just so you can justify your $200 super-periscope. Then, at the end of the Gadgetbox episode, we’d have a pull-back shot of our lonely hero standing atop his volcano refuge, staring meaningfully up at the multitude of stars above. And… credits . See you next week.